Mechanical grease for lubricating the trapezoidal screw (Z axle or endless screw) on filament deposit printers. A tube provides one application for the machine. Wolfbite adhesive solution is specially designed to allow 3D prints made with ABS filament to stick to the printer’s glass plate. This solution also avoids the phenomenon of "warping" (peeling) when printing. Solution compatible with all 3D printers and comes in a 60 ml bottle. Wolfbite adhesive solution is specially designed to allow 3D prints made with PLA filament to stick to the printer’s glass plate. This solution also avoids the phenomenon of "warping" (peeling) when printing. Solution compatible with all 3D printers and comes in a 60 ml bottle. Wolfbite adhesive solution is specially designed to allow 3D prints made with Polycarbonate filament or Polycarbonate ABS to stick to the printer’s glass or ceramic plate. This solution also avoids the phenomenon of "warping" (peeling) when printing. Solution compatible with all 3D printers and comes in a 60 ml bottle. The 3DPrinterOS Premium Licence, valid for 1 year, allows 3DPrinterOS box owners to use all the features offered by this management solution for your additive manufacturing ecosystem. NB: Please send us an e-mail after your order so we can send your licence. Thank you for your understanding. The 3DPrinterOS Education licence, valid for 1 year, offers the features of the Premium licence but adds special multi-user management adapted to larger organisations, businesses or schools. 3DPrinterOS is the Number 1 solution for centralised management of your 3D printers. EasyBox Wifi is the material part of the 3DPrinterOS professional solution that lets you connect your whole machine fleet in the Cloud. Pack of 2 PVC sheathed 145mm tweezers. The first pair of tweezers is straight while the second is curved. The sheathing provides excellent grip. Single-use latex gloves for handling all types of chemicals safely. Pack contains 25 gloves. No more separation problems between the first layer and printing plate! 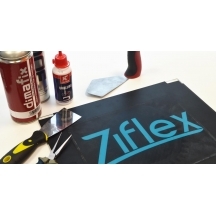 Printafix provides effective adhesion of your prints quickly and at a very reasonable cost per print. Novus is a cleaning solution recommended by the leading plastics manufacturers to polish, shine or clean plastic parts. Recommended for cleaning. 273 ml bottle. Pec Pad cleaning wipes from the Photosol brand. These dry wipes (without solution) have been designed specifically for lenses and mirrors because they don’t scratch or pill. Pack of 100 items.